Berenike II was a ruling queen of Cyrene by birth, and a queen and co-regent of Egypt by marriage to her cousin Ptolemy III Euergetes, the third ruler of the Ptolemaic dynasty of Egypt. 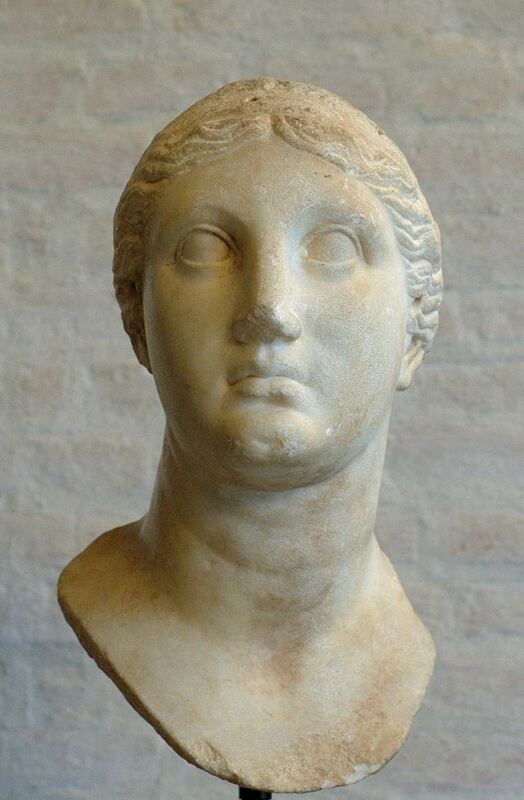 In approximately 249 BC, her father died, making Berenice ruling queen of Cyrene. Soon after her father died, Berenice was married to Demetrius the Fair, a Macedonian prince. After Demetrius came to Cyrene, he became the lover of her mother, Apama. In a dramatic event, Bernice had him killed in Apama's bedroom. Berenice stood at the door and instructed the hired assassins not to hurt her mother while she attempted to protect Demetrius. After the death of Demetrius, Berenice married Ptolemy III. Soon after her second husband's death in 221 BC, she was murdered at the instigation of her son, Ptolemy IV, with whom she probably was associated in the government. Obverse: BEΡENIKHΣ BAΣIΛIΣΣHΣ or abbreviated, head of Berenike II right, hair in a bun. Reverse: BAΣIΛEΩΣ ΠTOΛEMAIOY, eagle standing left on thunderbolt, wings closed.